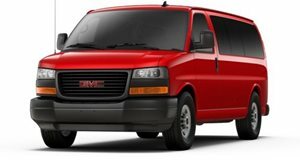 Available with either 285 hp or 342 hp V8 power mated to a 6-speed automatic or a fuel efficient 181 hp and a more modern 8-speed automatic transmission, the aging GMC Savana offers a broad range of engines for most applications. Regular and extended wheelbase options offer seating for up to 15 occupants. Base spec levels are low and while rear parking sensors, satellite radio and basic touchscreen are available, the Savana is essentially a no-frills offering. Safety systems are minimal although it does have a low price and counters with high practicality.